Diagnostic Imaging (DI) careers at Valley exemplify what it means to lead the way in transforming care. Our high-volume, high-energy DI department features progressive, innovative technology mastered by a team of professionals driven to have a profound impact on patient care. The technologists are all RT, ARRT licensed by the State of New Jersey. As part of our dynamic DI team, you will work with the latest modalities, enhanced facilities, and state-of-the-art equipment. 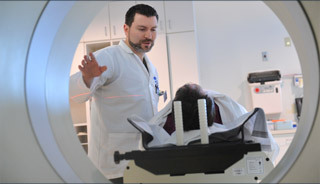 All modalities are ACR (American College of Radiology) accredited. Our highly integrated and thorough technology environment puts the latest tools in the hands of our team and provides clinicians with easy and seamless access to patient images and reports across the health system. With us, you will collaborate with a team of technologists to conduct diagnostic, therapeutic, interventional, and sophisticated procedures on patients using the latest technology. Our collaborative team of radiologists provides nationally recognized quality care in an environment in which safety is paramount. A strong commitment from Valley leadership ensures that as the needs of the health system and our patient community evolve and grow, so too will the capabilities of our DI department.